In December 1945, just four months after completing Animal Farm, British novelist and journalist George Orwell wrote "Politics and the English Language," a cautionary essay on the hazards of bad writing. 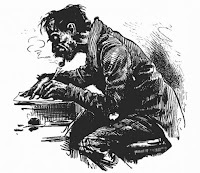 Bad writing is dangerous, Orwell contends, because it's habit forming. reading too much bad writing threatens our ability to think with care and precision. "The slovenliness of our language makes it easier to have foolish thoughts," Orwell writes. But sloppy thinking isn't the cause of most bad writing, Orwell says. Haste and laziness are. "The attraction of this way of writing is that it is easy." If at all possible to cut a word out, always cut it out. "These rules sound elementary, and so they are," writes Orwell, "but they demand a deep change of attitude in anyone who has grown used to writing in the style now fashionable." Sixty-five years later things have hardly changed. Imagine how much more effective the majority of marketing communications would be, if all writers followed his advice.